Love for pork roll (or Taylor Ham, depending on where you live) runs deep in the Garden State. So deep, in fact, that one minor league team is changing its name in honor of the regional delicacy. The Trenton Thunder announced that the team will change its name to the "Pork Roll" each Friday for the upcoming season. The change comes complete with new jerseys and a logo that both mimic the popular processed meat. "Pork Roll is a New Jersey staple that can be served on everything from breakfast sandwiches to burgers and we're thrilled to celebrate it on a daily basis at ARM & HAMMER Park," said Jeff Hurley, the team's general manager and chief operating officer. He added, "Re-branding ourselves as the Thunder Pork Roll on Friday nights is the perfect way to celebrate a Garden State favorite!" 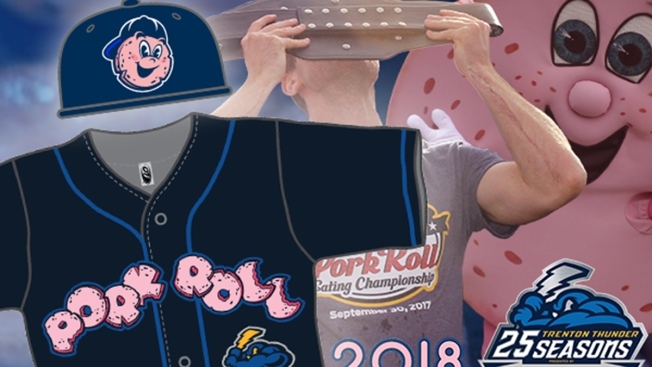 On May 18, the first Friday the team -- the Yankees' double-a affiliate -- will wear the get-ups, the team will be giving out pork roll aprons and $1 pork roll sandwiches.